A EA Spokesman has confirmed the beta rumors. "As for the beta, we'll have more details later this week"..
Gamestop leaked news about the upcoming beta and even provided a launch date. (November 19th, 2009). "Stay tuned to the blog or follow us on Twitter for future developments on all things Battlefield Bad Company 2," said producer Gordon Van Dyke in response to the beta/demo question. In "Battlefield: Bad Company 2", the ‘B’ company fight their way through snowy mountaintops, dense jungles and dusty villages. With a heavy arsenal of deadly weapons and a slew of vehicles to aid them, the crew set off on their mission and they are ready to blow up, shoot down, blast through, wipe out and utterly destroy anything that gets in their way. Total destruction is the name of the game, delivered as only the DICE next generation Frostbite™ engine can. Either online or offline, enemies will soon learn there is nowhere to hide. For all the latest Xbox 360 gaming, hardware and homebrew news, stay tuned to the 360-HQ Homepage or install our FREE 360-HQ Toolbar which will automatically link you with all our latest content including: games, achievements, screenshots, trailers, cheats and much more. Xbox LIVE Deal of the Week: Battlefield 1943 and Bad..
Battlefield: Bad Company 2 Vietnam DLC Arrives Dec. 21 -..
Battlefield: Bad Company 2 ''Onslaught Mode'' Arrives..
Battlefield: Bad Company 2 ''Onslaught Mode'' Delayed for..
Bad Company 2 brings Onslaught as the game reaches 5..
Battlefield: Bad Company 2 - Server Upgrades COMPLETE! DEMO: Battlefield: Bad Company 2 now available on Live..
Bad Company 2 Vietnam & Black Ops today! Bad Company 2 "Vietnam" Players HERE! Bad Company 2 Vietnam anyone?? New Bad Company 2 Vietnam Interview Trailer on HQ! Bad Company 2 - HQ members night!!! 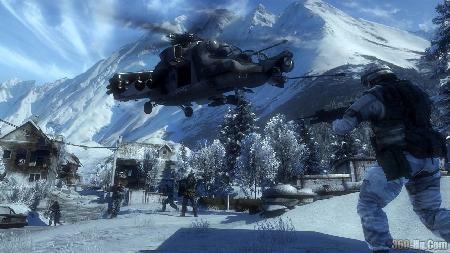 Bad Company 2 looking sweet!